00:00 - How do octopuses camouflage themselves? 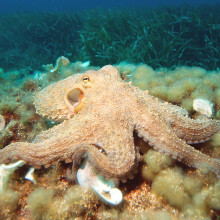 How do octopuses camouflage if they are colour blind? Felicity - So your listener's absolutely correct. they are colour blind so they only see in black and white and the shades of grey in the middle. 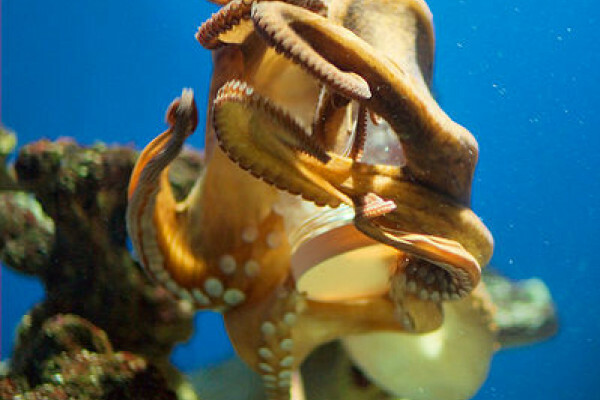 And all of the colours appear within that spectrum to an octopus so a much simpler world in terms of colour. Graihagh - So how on earth do they then go about camouflaging with the environment if they're colour blind? Felicity - Other than the fact that they can't see colour, they have incredibly good vision. So they can get a lot of accuracy about their environment, about the texture of their environment, about the brightness of their environment, and these are all really important things for when you're camouflaging to break up your outline, break up the pattern of your body. And generally, the way that predators pick out their prey is through movement, through brightness and through colour. So by getting the movement and the brightness right, they're taking away a few of the things that predators can use to spot them, and then it's only colour left. And we think this is probably due to the way that there's a limited set of colours available and octopuses use something called chromatophores in their skin. So they've got a range of pigments to work with and these are pushed towards the surface of the skin to change the colour, so lots of different sacks of colour that are pushed and manipulated and quite frankly, if they get it wrong they get eaten. So there's a sort of evolutionary pressure there. Graihagh - And presumably I'm thinking octopuses are underwater and, if you've ever been diving actually, it's not that colourful down there in the first place so it's not actually that useful to see in colour anyway. Felicity - No you lose a lot of different light frequencies under water, particularly the reds that get filtered out very early on. And the chromatophores that they're using are in the blacks, the browns, the oranges, yellows, those kinds of colours, so they do tend to go into those ranges. And there are some other cells that they can use which bring luminescence of blues and greens, which actually reflect light rather than using these pigments instead. So they've got a lot of things that they can use to change their colour but they're not necessarily aware of the colour they are. Next Will we ever return to the moon?